Hidden Dunes Beach & Tennis Resort, located in Destin, Florida, offers twenty seven acres of paradise, masterfully designed, constructed and landscaped to enhance the natural beauty of the beaches and creates a rare sense of privacy. 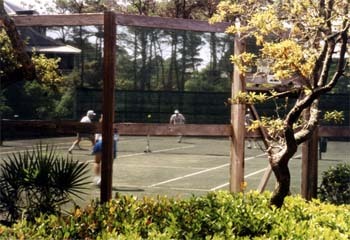 The professionally staffed tennis center features six championship clay courts framed by living windscreens. Natural shrubs, trees and vegetation add to your privacy and assure minimal interruption from other players. Our USPTA teaching staff offers a full complement of year round and seasonal tennis activities, instructional programs and packages which continue to attract tennis enthusiasts to the resort year after year. Services also available include ball machine rental and matchmaking services. We have a full service pro shop offering racquet stringing and repairs, tennis equipment, accessories and apparel.